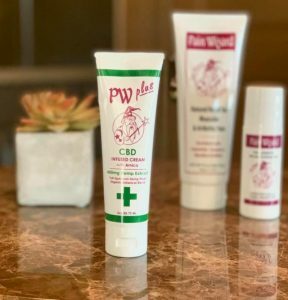 Pain Wizard is an advanced, deep-penetrating, fast-acting pain relieving cream that gives long-term relief from the inflammation and pain of arthritis, bursitis, tendonitis, back-aches, neck-aches, hips, elbows and knees. Pain Wizard is not greasy or oily and does not stain your clothes. Enriched with Menthol, Camphor, Arnica, Boswellia, Bromelaine, Capsaicin, Ginger, Willow Bark and MSM. And don’t miss PW Plus! This new cream has 450mg of Hemp Extract and Arnica! If you have been looking for a CBD product, look no futher. This is everything you love about Pain Wizard, plus CBD!